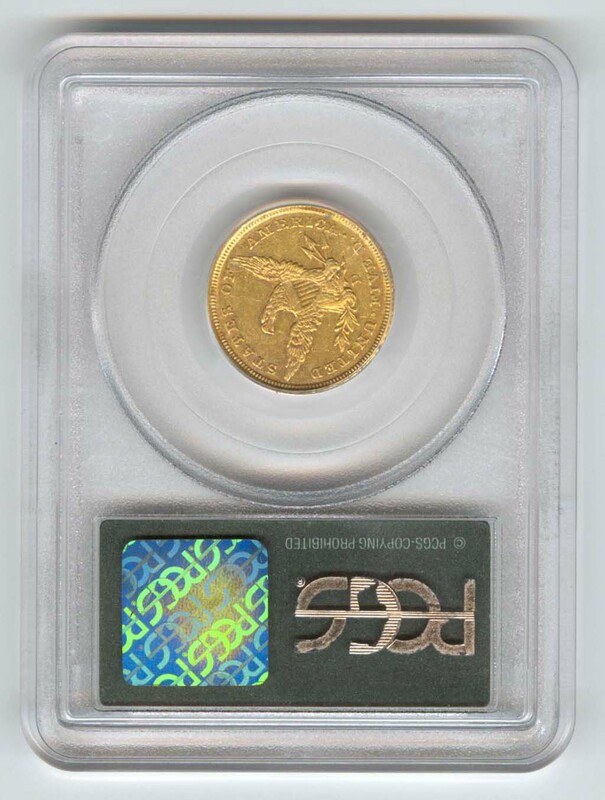 The five dollar gold coin, pictured here, came from the Dahlonega Branch of the United States Mint - an institution that opened its doors for business in February, 1838, before the building that housed it was completed, but after the roof started leaking. On March 3, l835 a bill was passed by Congress to establish branch mints. A few weeks later Ignatious Few was appointed commissioner to supervise the building of the mint in Dahlonega. It took almost a year to clear the way to start building; a site had to be selected, contractors found and scarce building materials obtained. Few was rarely in Dahlonega - so seldom that the citizens had appointed a committee to ask that he be replaced. Secretary of the Treasury Levi Woodbury was told by letter that Reverend Few was labouring under permanent ill health from rupture of the lungs and "he appears very laudibly & we may say entirely devoted to the affairs of another and better world & should be left quietly to their contemplation." Few remained the commissioner but devoted most of his time establishing a Methodist college called Emory. The superintendency of the mint was a political appointment. Joseph J. Singleton, an ex-legislator, got the job. He had lost his bid for Senator at Large of Georgia when a weekly newspaper, which favored his opponent, published the Senator's obituary just before Election Day. R. M. Patterson, Director of Mints, chose Joseph W. Farnum, a professor at Washington College in Virginia, to be assayer and David H. Mason, an inventor who owned a machine shop in Philadelphia, to be the coiner. These two men disliked each other on sight. Mason said that Farnum did not speak to him or his family when they were introduced. Farnum seemed to think he was superior to "a mechanic" and criticized him in a letter to Patterson for treating the men in his department as "companions." He bragged that he kept his men at a distance. The first month, he got rid of Charles Gilbert for not following orders. Gilbert, the experienced melter and refiner, said he did not come to Dahlonega to unload wagons and clean offices. When Farnum told him to do as he was told or leave - he left. As a replacement, Patterson sent William Warwick, an Englishman "thoroughly bred to the business from boyhood," good natured, industrious but reportedly sometimes given to drink. The work was like child's play to Warwick in a place where whiskey was plentiful, so he was a happy, congenial employee, perhaps about the only one in the mint. Both Farnum's and Mason's work and living quarters were in the mint building and hostilities continued until they found a common cause - their dislike of Singleton. Farnum wrote Patterson that the Superintendent's intellect and morals were "lamentably deficient" and added that he himself "had not the least reliance on his word." In a letter, Singleton mentioned that the assayer's "discharge of his duties speak for itself. All I could wish of him is that he was a more agreeable companion" and added "He has a multitude of frailties peculiar to our nature." Mason was more agreeable until he thought someone was interfering in his rights. When Singleton hired Frederick Boartfield, of the coining department, to haul some wood for the mint, Mason angrily confronted the Superintendent for not being first consulted. Singleton told the Director that he could not put on paper what the coiner said. Afterwards, when the Superintendent needed information from the coining department, he asked Charles Thomas, the mechanical engineer, for it. Thomas was assigned extra work - work that he claimed was to bring out Mason's inventions. When he was told to make some scales, he answered that he did not know how and the coiner issued the ultimatum to follow orders or leave. Thomas left, but not before he spread the word that he was driven off so that Mason's son, Zelotes, could have the job. Thomas said that when Zelotes was a visitor in Dahlonega, the coiner offered him $100 to vacate his place. Mason denied this, saying that a mechanic was not needed, and then he had to postpone getting his son in the mint. It was during these trying days that Singleton remarked in one of his letters, "I wish we had more to do." Other than the bickering and dodging leaks from a roof that had been replaced twice, the bullion deposits had greatly decreased. The Superintendent blamed Pinchback gold as a prominent reason for this. He wrote, "...there has been at this place an extensive purchaser of Gold Bullion, by the name of Pinchback, who is celebrated over the state of Georgia for selling Pinchback gold, alloyed with silver, however, in the place of copper. So soon as he makes up his usual melt (say some 40 or 50,000 dollars worth), he leaves with it for some unknown region." He pays "I would say on an average 6 pr cent for bullion over and above its mint valuation; and for our coin he gives as high as 8 pr cent." Later, Winter and Company of Augusta, Georgia made deposits at the mother mint that assayed 594 parts gold, 346 parts silver, 60 parts copper. It was traced to Pinchback, who hurriedly left Dahlonega. Many years later, a Dahlonega newspaper reported that the cellar, over which A. G. Wimpy's store stood, on the north side of the square, was filled up. Many old timers stood by watching and remembering that the store once belonged to Anderson Pinchback, who had a little furnace in the back part of the building where he mixed gold with a baser metal and formed it into very real-looking nuggets. These he took to places like Augusta and sold them to jewelers. "The business was carried on for some time before he was spotted and before Pinchback could be arrested he departed, leaving his stock of goods in Mr. Wimpy's hands and everything else behind and was not heard of any more until he was killed in some manner." The Dahlonega Mint's first and only coining in June, 1840 was done on the 10th day of the month and there had been no coinage in May. This small amount of $9,435 consisted of l,887 half eagles. When Singleton sent his report to Patterson, he mentioned that on a few of the coins, the under die had slipped so that the obverse and reverse devices stood quartering. Since there were so few of them and they were otherwise perfect, he had released them for circulation. In this case, Patterson agreed with the decision but insisted that hereafter the head of liberty should always be opposite the tail of the eagle. Much of the correspondence for awhile was about Mason. Singleton wrote to Patterson that while he was taking a visitor on a tour of the mint, he was approached by the coiner saying that a machinist was needed and that his son was available. The Superintendent had written Patterson twice that young Mason was undesirable because when he was a visitor in Dahlonega during the past year, he often drank to excess and was obnoxious. In another letter, the Superintendent had written, "It appears that Mr. Mason is determined to force his son upon the mint contrary to the wish, I believe, of every one concerned except himself." Singleton's worst fears were realized and he sought the advise of the Director, "Old Mr. Mason asserted this morning that I had given my consent on the appointment of his son, and that he could prove it by Dr. Farnum, because he had told Dr. F. shortly after I had done so. I do declare to you, and I am willing to be qualified in it, that I never gave such concent...". "Remember that I have no wish to interfere in this matter; but as you desire my advice, I will give it, and you will not be surprised that it leans to the side of peace. I would concent to Mr. Mason's retaining the services of his son, so long as he shall behave himself properly. You have always a superintending control over this matter." Mr. Mason tells his side of the story in a very lengthy letter telling why he needed his son and demeaning the Superintendent. A part of one long sentence is quoted here. "And at the last coining while I was at dinner, the men through neglect or otherwise, let the under Die be turned in its position so that the heads of the devises stood quartering, of which Dr. Singleton wrote to you and such has been the want of attention in the only remaining hand Mr. Boartfield, that I have lost my confiddence in him, and would if it were prudent to do so, obtain another in his place, but that would be removing Dr. Singleton�s favorite..."
The correspondence of the Dahlonega Branch Mint is a basis for the book, THE NEIGHBORHOOD MINT , and it tells how this pictured coin came to have an error; that Frederick Boartfield (the only person who was an employee of the mint during its entire existence) was responsible and that this coin was minted on June 10, l840, within about an hour of noon. Editor's Note: This interesting account refers to one of the few coins produced at the Dahlonega Mint that can be traced to the precise day of striking. 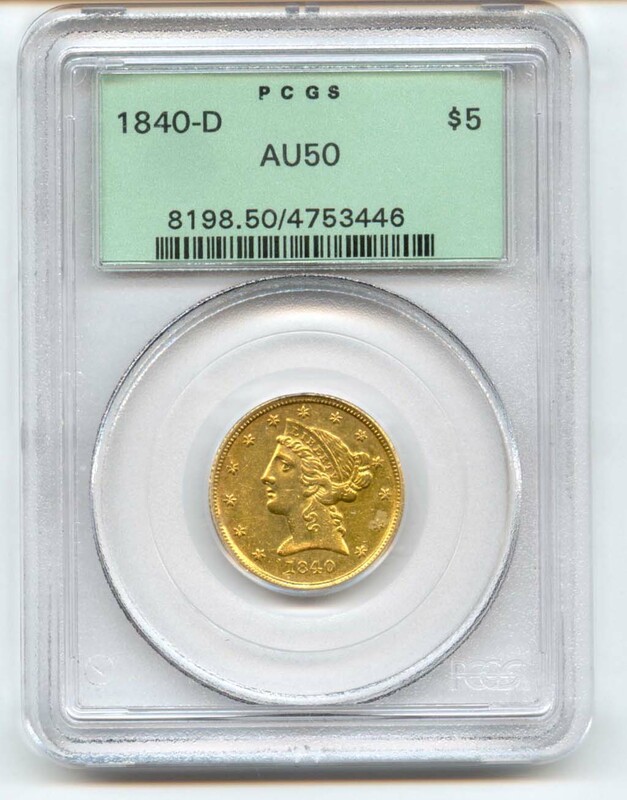 The 1840-D half eagle is an interesting one, with several varieties for which the collector can be on the lookout. Two pairs of half eagle dies for 1840 were received at the branch mint, probably on February 18, according to the late Clair Birdsall. The 1840-D half eagle mintage was struck in eleven separate runs during the year, with a total mintage of 22,896 pieces. Two strikings were made on February 22, totaling 4,437 coins. The branch mint�s production for 1840 continued with the striking of 1,975 pieces on April 14, 1,887 on June 10 (some of which exhibited the rotated reverse described in the article), 2,505 on August 16, and 1,347 on August 31. Superintendent Singleton reported on September 19 that a half eagle die had cracked while preparing it for use and that one die of the other pair of 1840-D half eagle dies had a "small defect." The branch mint went on to produce 3,101 half eagles in two separate strikings on September 23, as well as 2,380 on November 12, presumably with either a cracked or defective die. It is not known from the historical records whether these "problem dies" were obverse or reverse. A new pair of half eagle dies was not received in Dahlonega until November 28, according to Clair Birdsall. The year's production was completed with strikings of 3,050 coins on December 10, followed by 2,214 on December 30, presumably with the new pair of dies. The date is considered to be a scare issue, with 85-95 known, and 16-19 in grades above extremely fine, according to author Doug Winter. Winter identified two die varieties, although it is possible that others exist: Variety 3-B that has a medium-sized D mintmark, the right edge of which extends to the upright of the E in FIVE. This variety also has a significant obverse die defect, extending out from the denticles toward the thirteenth star (this may be the "small defect" referred to by Superintendent Singleton). Variety 4-C has a small-sized mintmark, with the upright of the mintmark positioned over the gap between the inner serifs of the two diagonals of the V in FIVE. A reverse die crack runs from the rim through the right diagonal of the V, through the right side of the mintmark, through the feather and branch stem and on into the shield. This die crack may be the one referred to by Superintendent Singleton. The coins produced on June 10, 1840, with the rotated reverse are considered to be rare. Differing degrees of rotation, including as much as 180 degrees, have been reported. The opinions of the experts differ on whether or not both "Broad Mill" coins, measuring 22.5 mm in diameter, and "Narrow Mill" varieties, with a diameter of 21.65 mm, exist for this date. As your editor has yet to see conclusive proof of "Broad Mill" examples of the 1840-D, I am reserving judgment on this question.